Peripheral neuropathy is a common complication of diabetes and is found more commonly in those who have a history of chronically elevated and un-controlled blood sugar levels. For diabetics or pre-diabetics researching common long-term complications of diabetes I’d invite you to read these posts from my archives on diabetic neuropathy in feet, checking your blood sugar levels, lowering blood sugar levels naturally. As you might expect from the above links peripheral neuropathy occurs as a direct result of poorly managed blood sugar levels. Diabetics should always do their best to manage their blood sugar levels through diet and exercise and through individually prescribed medical advice from a personal physician but even the most vigilant of patient still may struggle with maintaining healthy levels of blood sugar and should always keep watch for changes in your peripheral nerve sensitivity. As you might expect peripheral neuropathy is characterized by damage to the nerves in the peripheral areas of your body. These typically include the ends of your arms and legs, your feet and hands in particular. There are a number of causes for neuropathy but in the context of this article we will focus only on diabetic neuropathy which is among the most common causes for the condition. The long-term effects of elevated blood sugar levels and insulin running through the body result in a slow degeneration of the nerve endings, especially those which are long nerves. As such the feet and hands are most affected. Diabetic neuropathy also extends into the eyes and is often responsible for diabetic blindness. The optic nerve is damaged due to the complications of diabetes and vision loss can occur. This is commonly referred to as diabetic blindness, optic neuropathy or optic neuritis. The most common symptoms of peripheral neuropathy in diabetics and non-diabetics alike is a lack of sensation in the areas of the body near the nerve endings. Of all the areas of the body the nerves are longest in the legs as they extend the entire length of the body and reach all the way to the tips of the toes. Of all the areas these are the most common nerves to be damaged by chronically poor blood sugar levels and the body’s over creation of insulin which is produced in response to high glucose levels in the blood. The lack of sensation in the nerves can either be a diminished ability to feel light sensations to a complete loss in sensory activity in the affected area. In either case this is significant for diabetics because physical activity and exercise is so important to keeping blood sugar levels under control. When the feet lose their sensory ability it becomes very easy to injure your foot without realizing it. This results in many foot injuries that do not come with pain and as a result they get much worse than they ever would in people who can feel pain in their feet. Because of the seriousness of neuropathy in the feet it is advised that diabetics with advanced diabetic complications such as these should always wear shoes for neuropathy and seamless diabetic socks. Both of these products are designed to help minimize foot injuries in those who cannot feel their feet. It’s worth noting that peripheral neuropathy can be experienced in other areas of the body including the hands, arms, legs, and optic nerves but the lack of sensation is far more common in the lower legs and feet. A much less common symptoms of peripheral neuropathy in diabetics is nerve pain. The eyes is one area which does experience some pain during the initial onset of neuritis symptoms but nerve pain in the arms, legs, hands, and feet are much less common. Despite their decreased frequency however peripheral neuropathy pain can sometimes be quite significant and a major annoyance for diabetics. Neuropathy pain when present typically presents as a slight numbness or tingling in the affected area. Much like when your leg or arm falls asleep and the tingling, pins-and-needles sensation occurs, neuropathic pain feels similar. The pain of neuropathy is not usually a long lasting symptom. Most people who have it experience a gradual decrease in the pain over time. This can be because of a decrease in weight where the pain persists as the nerve sensation improves or at the onset of nerve degeneration. In any even there are some OTC treatments for peripheral nerve pain as well as some treatments your doctor may prescribe but waiting it out is also a viable option if the pain is not too bad. Above all neuropathy in feet is the most common complication of diabetes. When diabetics have a difficult time managing blood sugar levels the most common result is neuropathy that first presents as numbness and eventual lack of sensation in the toes, feet, and lower legs. This is often times coupled with poor circulation in the feet and a reduced ability to heal wounds due to the low levels of circulation. Many diabetics end up experiencing swelling of this area as well which leads to additional problems like clotting. Heart attacks and strokes are much more likely to occur in diabetic people and clots formed in the arteries of the leg are just one reason for this. If you have diabetes you need to take steps to minimize the chances of developing neuropathy. This includes eating a type 2 diabetes diet which is low on the glycemic index and exercising regularly. If you do plan on exercising regularly you have to wear well made diabetic walking shoes and seamless socks. Your shoues will help protect your feet while you exercise so make sure to maximize this benefit. Early warning signs for neuropathy in feet include pain, numbness, tingling, r pins-and-needles sensations in the feet or lower legs. Chronically uncontrolled blood sugar levels is another early warning sign that you may develop neuropathy. Neuropathy in the hands and forearms develops just like it does in the feet. The main difference however is that the chances of developing neuropathy in the arms is much less. This is not to say it’s not worth thinking about but neuropathy of the hands is easier to deal with because it’s easy to see when you’ve injured, cut, or scraped your hand when you have minimal sensation. This is completely opposite of the feet in which it is hard to physically see damage to the area when it occurs. Ulnar neuropathy is a common form that develops in the arms. It is most frequently found in the elbow where the ulnar nerve is most frequently pinched in the joint. It may be worth noting however, that ulnar neuropathy symptoms may be caused by many other factors completely unrelated to your diabetes. If you suspect you are developing ulnar neuropathy in the elbow you may want to see a specialist who can properly diagnose the condition and cause. The last major form of common diabetic neuropathy is that of the optic nerve. This nerve transmits information from the retina to the brain and when diabetes and high blood sugar levels exist for many years the nerve can become damaged and starved of blood flow. This causes a degeneration of the nerve followed by partial or total blindness. As stated earlier the most common early warning sign for neuropathy in the optic nerve is eye pain when the eye is moved in the socket and color distortion. When diabetic neuropathy begins affecting the optic nerve the most common symptoms experienced is vision loss. The loss in vision experienced by diabetics with optic neuritis can fall on a sliding scale anywhere between slightly blurred vision in one eye to total blindness in both eyes. The vision los does not happen over night but comes on gradually over time. It can slowly develop over the course of weeks, months, and even years. Typically (but not always) there are some warning sings and symptoms for the onset of optic neuropathy that can be identified before vision loss occurs. Many people with diabetic neuropathy in the optic nerves experience some pain in the eyes when they are moved, color distortion, and the onset of blindspots in one’s field of vision. The onset of neuropathy in the eyes is often associated with multiple sclerosis (MS) however this association is greatly reduced when it is caused by complications of diabetes. When it occurs outside on the context of diabetes it is thought to be an autoimmune condition where the body turns on itself. When diabetes is the main cause it is thought that the damage to the optic nerve is caused by reduced blood flow as a result of diabetic problems like chronically elevated blood sugar and insulin spikes from the pancreas. As you can see the symptoms of diabetic peripheral neuropathy are not to difficult to notice and the early warning signs are simple to understand. Diabetic neuropathy in particular is almost always the result of long-term diabetes and chronically elevated blood sugar levels. Even if you are not experiencing the symptoms of neuropathy such as vision loss, lack of sensation in the hands or feet, or related problems like poor circulation you can see that failing to control blood sugar levels will most likely lead to these symptoms later on in your life. Takes steps early, before these problems develop or get worse and you will live a much more fulfilling life even as you fight diabetes into your golden years. For related information make sure to check out this post on practicing better diabetic foot care and if you found this post helpful please take to time to share it with your friends and family. Thank you. There is a way to reverse type-2 diabetes from getting worse. In fact, you may even be able to reverse diabetes all together if you are lucky and not too far advanced in your condition. It all has to do with eating the right foods and adding the right kinds of physical activity into your lifestyle. The following guide goes into all the details including your diet, your activity levels, and lifestyle choices and how you can change them to improve your chances at beating type-2 diabetes. Wearing the right shoes will help you stay active but this guide will show you exactly how to improve your situation today. 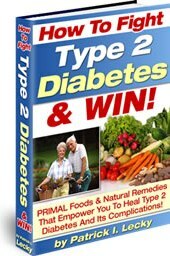 Click here to review How To Fight Type 2 Diabetes And Win and see if it's right for you. What Are The Side Effects Of Low Blood Sugar in the Elderly? What Causes Low Blood Sugar In Men and Women? What Is A Good Low Blood Sugar Treatment and Prevention Plan? Are Diabetic Slippers Important To Wear? How Much Do Diabetic Slippers Cost? What Are The Features Of Diabetic Slippers… And What Are Diabetic Slippers Anyway?